The ‘library’ is fetched from a Windows resource defined in the XAML, with this resource being bound to the DataGrid (see earlier post for full details). In writing this code, we glossed over some of the details of how the XElement is built. In fact, we used several techniques in this code that could do with further explanation. The first parameter gives the name of the XElement, which is used as the tag when writing out the XML. Usually, we’ll just enter a string here, and rely on the fact that the XElement constructor will convert this into an XName internally so we don’t need to worry about it. The second parameter uses C#’s params keyword, which allows a variable number (one or more) of arguments to be passed to the constructor. As the data type of the content is just ‘object’, any data type can be passed as the content of an XElement, and it’s here that the richness of the XElement class comes into play. There are 8 specific data types that are handled in special ways when passed in as the content. XText: This is a special class which is added as a child node of the XElement, but its value, which is a string, is used as the XElement’s text content. XCData: This allows insertion of the XML CData type, which consists of unparsed character data. Such strings may contain characters such as > and &, which ordinarily have a special meaning in XML syntax, but would be ignored here. XElement: The content can be another XElement, which is added as a child node to the parent XElement. XAttribute: This object is added as a child node, and represents an attribute of the parent node. XComment: Allows a comment to be attached to the XElement. IEnumerable: This is the magic data type, since it allows collections of data, such as those produced by LINQ query operations, to be passed in as content. The elements in the collection are iterated over, and each element is treated as a separate parameter. We used this feature in the code above to insert a list of Book objects into the XML using a LINQ Select() call. In addition, you can also pass a null as the content (which does have its uses, though we won’t go into that here). Finally, if the content is any other data type, the XElement will call the ToString() for that data type and use that as the content. This can cause some confusion, since there are some other LINQ to XML classes (such as XDocument) that are used to attach properties to the XML file that will be accepted as content for XElement, but rather than having the expected effect, XElement will just call its ToString() method and use that as content. The top level XElement has the name ‘Library’. Its first content is a comment, which is written with the <!–…–> delimiters. Next, we’ve added a content object of type Program (that is, the class in which this program is written). The output is produced as a normal XElement tag, but the ToString() method is called from the Program class since it’s not one of the data types that has special meaning as an XElement content. The default ToString() method for a class just produces that class’s full pathname, which in this case is LinqXml03.Program. Next, we add a couple of Book elements, each of which contains a couple of other XElements for the author and title. We’ve also added an XAttribute for the number of pages in the book. The last two lines demonstrate the difference between XCData and XText. The XCData reproduces the given text exactly, and encloses it within the <! […]]> delimiters used for CData. The XText places the text as the content of the Library tag, and translates special characters into the XML code, so that > become &gt; and & becomes &amp;. We’ve already seen an example of using IEnumerable in the code fragment at the top of this post. LINQ provides a library of classes and methods that allow XML to be generated and imported quite easily (certainly more easily than with previous .NET libraries). We’ll assume the reader is familiar with the basics of XML syntax and dive in with a simple little program that allows the user to enter some details for books in a library, then store this data to a disk file as XML (and of course to read in data from an XML file and display it). On lines 7 to 9 we create the resource, then use it as the data context for the Grid on line 11. The DataGrid defined on line 25 uses this data context as the binding for its ItemsSource property, and then we define the three columns, each bound to a property in the Book class. We could have used the auto-generate column feature of a DataGrid, but that doesn’t allow us to customize the widths of the columns, which we’ve done here by assigning each of the Author and Title columns 45% of the horizontal width, with Price getting the remaining 10%. With the data structures set up and the binding in place, we could run the program and enter some book data, and the data binding will automatically update the ObservableCollection as we enter data into the DataGrid. However, at this stage we have no way of saving the data thus entered. For that we introduce the XML. First, we’ll have a look at the event handlers for the Save and Save As menu items. The SaveFileDialog (and OpenFileDialog) classes are in the old Microsoft.Win32 namespace, but they still seem to work well enough. In order to allow us to save changes to a currently open file, we have an auxiliary string called saveFilename. If this string has zero length, then we open the SaveFileDialog to get the user to select a filename. The dialog has a filter that displays only .xml files. Once a file has been chosen, the saveMenuItem_Click() handler is called, and the method XmlFromLibrary() is called. We’ll consider this in a moment, but first we need to describe the XElement class. In LINQ’s handling of XML, all XML tags are represented by XElement objects. There is no need for a separate, top-level document object in which to place the XElements; XElement itself can serve as the top level, and all lower levels. Nested tags in the XML are represented simply as nested XElement objects. This gives the C# code a structure that is easy to understand for the human reader. After retrieving ‘library’ from the Windows resources, we create the XML representation of the library with a single C# statement. The top level object is libraryElement, which is given the tag LIBRARY. The second argument to its contructor is built using a LINQ Select() call on library. Remember that library consists of a list of Book objects, so we simply iterate through each Book in the list, and construct a new XElement for each Book. Within the Book’s XElement, we add 3 more XElements for the Author, Title and Price fields. The Save() method produces the usual first line of an XML file, and then writes out the XML itself, all neatly indented. In the openMenuItem_Click() handler, we use the static XElement.Load() method to read the XML from the file into an XElement. In LibraryFromXml() we again retrieve the library resource and clear it of existing data. Then we call the Elements() method on the XElement to retrieve a list of BOOK tags. This produces an IEnumerable list of XElements for the BOOK objects in the original XML. 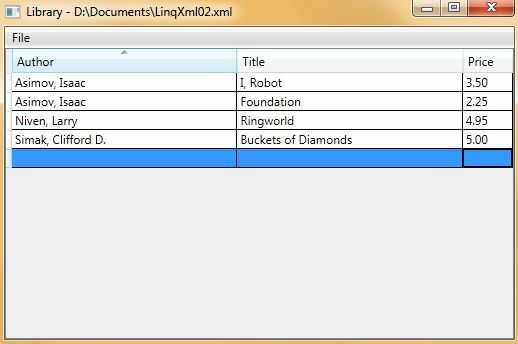 For each of these, we simply create a Book object by extracting the AUTHOR, TITLE and PRICE XElements for each BOOK, and then add this Book object to the library. The data binding takes care of the rest, so the DataGrid is automatically updated to display the list of books we read in. There’s a lot more that can be done with LINQ and XML, but this little example should show you that for saving and reading basic XML, LINQ is easy to use. We’ve seen how to create a Dictionary using LINQ. A Dictionary is a hash table in which only one object may be stored for each key. It can also be useful to store more than one object for a given key, and for that, the C# Lookup<> (part of the System.Linq namespace) generic type can be used. LINQ provides the ToLookup() method for creating Lookups. It works in much the same way as ToDictionary(), except that as many objects as you like can be attached to each key. This is the simplest version of ToLookup(). The method takes a single argument, which is a function specifying how to calculate the key. In this case, we just take the first char in the string pm.lastName. For some reason, the Lookup class doesn’t contain a property for retrieving the list of keys, so we need to use a roundabout method to get them. Line 5 uses a Select() to retrieve the keys and an OrderBy() to sort them into alphabetical order. We can then iterate over the keys and, for each key, we can iterate over the prime ministers for that key. Note that the object pmLookup01[key] is not a single object; rather it contains a list of all prime ministers whose last name begins with the letter contained in the key. The first argument to ToLookup() now passes the entire pm.lastName, and the second argument to ToLookup() is the comparer object. When we print out the results, we have to remember that the key for each entry in the Lookup is now the full last name of the first prime minister encountered whose name starts with a given letter. Thus if we printed out the full key, we’d get a full last name. That’s why we print out key on line 8; that way we get the first letter of the name. We’ve returned to using the first letter of the last name as the key (that is, there’s no comparer), and passed in an anonymous data type as the second argument to ToLookup(). Apart from that, the code is the same as in the first example. Now we’re back to using the full last name as the key, since the comparer does the checking for matching first letters. Just make sure you pass in the arguments in the right order: (1) choose key; (2) choose custom data type; (3) choose comparer. We’ve seen how to add a database to an MVC 4 project, and how to enter data from a web page and store it in the database. Here we’ll look at how to retrieve the data and display it on a web page. The database is accessed using the same method we discussed in the post on adding a database. The DbSet field, ComicBooks, in the ComicContext class represents a data set on which we can run LINQ queries. Here, we’ve done a simple query that selects all the entries in the DbSet and sorts them by the Title field. Having retrieved the data, we need a way of sending the data to the view so it can be displayed. The ViewBag is a C# dynamic variable (on which I hope to post soon). The data type of a dynamic variable can change as the program runs. In particular, we can define data fields for this variable at runtime rather than compile time, which is what is done here. We’ve defined a Comics field for the ViewBag and assigned it the result of the LINQ query converted to a List. The ViewBag is a utility variable which is available in the View class, and is a ‘bag’ into which we can throw any data we want the view to display. You might think that this sort of thing can rapidly get out of hand; after all, we could throw loads of data into the ViewBag and lose any pretense of a well-structured program. This is true, but then a well-designed web page shouldn’t display too much on one page anyway, so if we’re writing a decent web site, there shouldn’t be any need to throw too much data into the ViewBag. The volume number is printed in bold, and the issue is surrounded by parentheses (so the parentheses around @comic.Issue are printed out; they’re not part of the C# code). That’s really all there is to accessing and displaying data, although of course there are a lot of other things you can do to add bells and whistles. Up till now, we’ve considered only the deferred standard query operators, which are not evaluated until their result is actually enumerated by, for example, running through the result in a foreach loop. LINQ also has a number of non-deferred operators, which are evaluated at the point where they are called. The first of these we’ll look at is ToDictionary. C# has a built in Dictionary data type, which is an implementation of a hash table. A hash table is essentially a glorified array, with the main difference being that any data type can be used as the array index or key. For example, if we wanted to store our list of Canadian prime ministers in a dictionary, we could use the integer ID we’ve assigned each prime minister as the key, or we could use the person’s last name, or even define some other data type from the components of a PrimeMinisters object. The one essential property is that each key must be unique, so that only one prime minister is stored for each key. ToDictionary() here takes a single argument, which is a lambda expression defining the key. The variable k is an element from the input sequence, and we’ve selected the ‘id’ field from that element to use as the key. Once the dictionary is built, we use a foreach loop to run through the list by selecting each key from the Keys property of the dictionary. We use array-like notation (square brackets) to reference an element in the dictionary. Each element in the dictionary is an object of type PrimeMinsters. There are three more variants of ToDictionary, each offering a bit more flexibility than the basic version. A second type allows the specification of a comparer class which can be used for defining the equality of objects used as keys. In the previous example, the default definition of equality was used; since the keys were ints, two keys were equal if they had the same numerical value. However, it is possible to define keys to be equal based on any criterion we like. For example, if we stored the ID of each prime minister as a string instead of an int, then we could define two keys to be equal if their strings parsed to the same numerical value. This would allow the strings 12 and 00012 to be equal as keys, since the leading zeroes don’t change the numerical value. Remember that we need to implement IEqualityComparer<string> and provide an Equals() and GetHashCode() method. In Equals() we parse the two strings and define equality to be true if their numerical values are equal. GetHashCode() must return the same code for two objects that are considered equal, so we call GetHashCode() on the parsed int. This time, we store the key as a string and pass an IdKeyEqualityComparer as the second parameter to ToDictionary. When we print out the results, we create a different string by prepending three zeroes onto the key in the dictionary, then use that zeroKey as the key when looking up entries in the dictionary. The dictionary uses its comparer object to compare zeroKey to the valid keys in the dictionary, and if a match is found, the corresponding object is returned. The output from this code is the same as that above. If no match is found an exception is thrown, as you might expect, so be careful to ensure that all keys used to access the dictionary are valid. The third variant of ToDictionary allows us to create our own data type from the sequence element being processed and store that new data type in the dictionary. For example, suppose we wanted to store the string representation of each prime minister in the dictionary instead of the original PrimeMinisters object. We can do that using the following code. The first argument to ToDictionary specifies the key as usual (we’ve gone back to using the int version of the key). The second parameter calls the ToString() method to produce a string which is stored in the dictionary. When we list the elements in the dictionary, we print out the entry directly, since it’s a string and not a compound object. The output from this is the same as from pmDictionary03. All the LINQ operations we’ve seen so far have worked on lists of type IEnumerable<T>, where T is the data type of the objects in the list. This is fine for most of the current data types in C#, such as the generic List<T> and the C# array. However, some older data types, such as the ArrayList, do not implement IEnumerable<T>; rather they implement the older, non-generic IEnumerable interface. If we want to use these older data types with LINQ, we must convert them to IEnumerable<T>. There are two methods that can be used to do this: Cast<T> and OfType<T>. Let’s look at Cast<T> first. If we tried to call OrderBy() directly on pmArrayList01, we would find that the code wouldn’t compile. If you’re using Visual Studio’s Intellisense, you’ll also notice that most of the LINQ functions don’t show up in the list anyway. The problem is that the ArrayList is not an IEnumerable<T>. We call Cast<PrimeMinisters> on this list first, followed by a call to OrderBy() to sort the list by last name. Thus the general rule is that the object calling Cast<T> must implement IEnumerable, and the output from Cast<T> is of type IEnumerable<T>. The problem is that the Cast<PrimeMinisters> method requires that all elements in the list passed to it are of type PrimeMinisters, and it throws an InvalidCastException if any elements in the input list aren’t of the correct type. There is one important point about Cast<T>: remember that it is a deferred operator, so it isn’t actually executed until an attempt is made to enumerate its output. That is, if we omit the foreach loop in the above code, but retain the (erroneous) call to Cast<PrimeMinisters>, the code will compile and run, seemingly without errors, since we haven’t attempted to enumerate the ‘sorted’ object. The actual exception is thrown only in the foreach loop when we try to enumerate the elements of ‘sorted’. After adding the strings, we first call OfType<PrimeMinisters> and pass the result to OrderBy. The OfType call will look only for elements in the ArrayList of type PrimeMinisters, and ignore the string objects. Thus the list passed to OrderBy contains only the correct type, and the ordering and subsequent foreach loop both work properly. The results of this foreach loop are the same as with our original Cast above. The Cast and OfType operators can also be applied to IEnumerable lists. Cast isn’t much use in this regard, since if we start off with an IEnumerable, we don’t need to convert it to the same list. However, OfType is useful as a filter, since it can be used to create a list of a specific data type from a more generic starting list. We can isolate the PrimeMinisters objects by using OfType on the object array (remember that a C# array is an IEnumerable<T>). Finally, it’s worth noting that there is a third conversion operator called AsEnumerable<T> which does take an IEnumerable<T> as input and produces another IEnumerable<T> as output. Although this may seem pointless, it’s actually essential when we deal with databases. But we’ll leave that until we consider the use of LINQ with databases. LINQ allows sequences to be combined using the usual set operations of union, intersection and difference. Using these commands is pretty straight forward, so we’ll give an example which illustrates all of them. Note that although all the elements are there, the one element that is in end20 but not in start 20 (Laurier’s term) appears at the end even though by date it came first. This is because Union() yields elements in the order in which it processes them, and since end20 was the second sequence processed, its unique entries appear at the end. We have added the OrderBy() clause in the code above to fix this, and this just results in placing Laurier’s term at the start. It’s worth pausing here to reflect on what Union() and the other set commands do when they compare two elements in the sequence to test them for equality. In the absence of any external comparer class or implementation of the IEquatable<T> interface, the equality test is done by calling the built-in Equals() method from the Object class. For reference data types (that is, objects created from classes as opposed to value types such as int), Equals() compares the references of its two objects and returns ‘true’ only if both objects have the same reference, that is, if the two objects are actually the same object, in the sense that they occupy the same location in memory. Thus two different objects that happened to have the same values for all their data fields would not be considered equal by the default Equals() method. The code we have written here thus depends implicitly on the fact that the set operators don’t make copies of the objects they are comparing; rather they simply reorder and classify the existing objects without modifying or copying them. If we wanted to make the code a bit more iron-clad, we should provide overrides of the Equals() and GetHashCode() methods, and/or implement the IEquatable<T> interface, as described in the earlier post. In some cases, this is difficult or impossible to do, as in our example where the data type being manipulated by the set operators is an anonymous type. Laurier’s and Chrétien’s terms have been omitted since they extended outside the 20th century. In this case we didn’t need an OrderBy() since all the included terms were in the first sequence and were already ordered. Distinct() uses the same equality test as the other set operators, so in order for it work, the above list must contain the same object duplicated in each case rather two objects, one of which is a copy of the other. Again, if you want to remove duplicates where different objects have the same data field values, you’ll need to provide a customized equality tester in some form (choose one of: implement IEquatable<T>, override Equals() and GetHashCode() from object, or provide a separate class that implements IEqualityComparer<T> for your data type). Finally, all four of these operators have a second version in which we can pass an IEqualityComparer<T> object as a second parameter, thus allowing a custom equality test. We’ve already seen how to do this, so we won’t repeat it here. We’ve seen how to define a custom equality tester for use in the LINQ GroupBy() command, allowing us to specify when two elements of a sequence should be placed in the same group. There’s a deeper issue here which merits some examination. The documentation for GroupBy() says that if no custom equality tester is specified, or if null is passed in for such a tester, then the default equality comparer ‘Default’ is used to compare keys. What does that mean? This ‘Default’ is a property of the EqualityComparer<T> generic type which provides a way of building equality testing into the class T rather than writing a separate class which implements the IEqualityComparer interface. To use Default, our class T must implement the IEquatable<T> interface, which requires us to write a single method Equals(T). As you might guess, this method provides an equality test between the calling object and the argument to Equals(T). In this example, we define two terms to be equal if their id numbers (representing the prime minister who held that office) are equal. With this definition, a call to EqualityComparer<Terms>.Default.Equals(term1, term2) will call this Equals() method using term1 as the source object and passing term2 as the argument. This code contains the simplest call to GroupBy(), specifying that the Terms object ‘term’ itself is to be used as the key. If everything works, since we haven’t specified an IEqualityComparer object, the Default option should be called, resulting in the terms being grouped according to their id. However, it doesn’t work; every term is placed in a separate group. What went wrong? Now we try our GroupBy() call again. However, it still doesn’t work, and by placing breakpoints in the debugger we can see that neither of these Equals() methods is getting called. What’s going on? How can GroupBy() being doing any grouping if it never does any comparisons between keys? Now if we run the GroupBy() again, we find that it works: terms with the same id are placed in the same group. Also, if we trace the code with the debugger, we find that every term results in a call to GetHashCode() but a call to Equals() (the IEquatable version) is made only if two hash codes are the same. In this case, the overridden version of the Object Equals() method is never called so we didn’t really need it, but it’s a good idea to have it there anyway since other code could call it and we want our equality tests to be consistent. In summary, then, the proper way to implement IEquatable<T> is to provide its Equals() method, and override both Equals() and GetHashCode() from the Object class, ensuring that both Equals() methods make the same test and that GetHashCode() returns the same code for any two elements that are defined as ‘equal’.